Bedford Eye Care News: Buying 'cheap' sunglasses can be hazardous to your health. Buying 'cheap' sunglasses can be hazardous to your health. 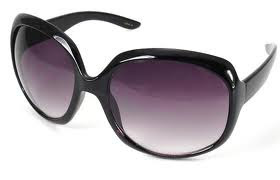 As part of an operation that involved numerous provinces in Italy, the Venice Guardia di Finanza (Italian tax police) seized about 560,000 pairs of sunglasses made in China and valued at 10 million Euro: the lenses were considered to be an extreme health hazard. The operation was triggered by a display of eyeglasses in a Venice store with price tags that were well below market prices: a subsequent check of the goods revealed that the labels and CE markings had been illegally applied. Technical analyses of the material demonstrated that in addition to not having UV filters, the lenses also released nickel on contact with perspiration. Also seized were 3.2 million labels that would have been applied to products imported from China to Italy. Nickel can cause nasty rashes and allergic reactions if it comes into contact with skin and nickel dust is a carcinogen if inhaled. Sunglasses that do not have proper UV protection actually expose you to higher levels of UV light since your pupils remain dilated behind the sunglass lens and allow even more light and UV rays to enter the eye. Excessive exposure to UV can lead to earlier development of cataracts and macular degeneration. The seven Chinese and Italian importers involved paid less than ten Eurocents a pair for the seized eyewear, which was placed on the market at prices ranging from 8 to 15 Euro.